Connect Wowza GoCoder to Wowza Streaming Cloud with Ul We hope it is easier for you to find articles about the Wowza products, services, and developer tools you use. Leave a comment and let us know what you think. Wowza GoCoder™, an RTSP-based encoding app for Apple iOS and Android mobile devices, can be used as a video source for Wowza Streaming Cloud™ ultra low latency streaming. 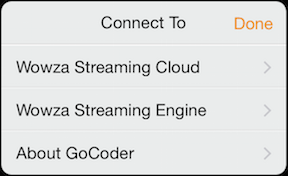 After you've added an ultra low latency stream target in Wowza Streaming Cloud, follow these instructions to configure the GoCoder app to send an encoded stream to the Wowza Streaming Cloud ultra low latency target. You can use the details of the ultra low latency stream target to connect the Wowza GoCoder™ mobile app to the target. First, download the free Wowza GoCoder app for iOS from the Apple Store or for Android from Google Play. If you are using GoCoder for iOS 2.0.5 or later, you can connect GoCoder using the Connection Code available on the ultra low latency stream target details page. Otherwise, if you are using an earlier version of GoCoder for iOS or an Android version, connect GoCoder manually. If you are using GoCoder for iOS 2.0.5 or later, the easiest connection method is using the Connection Code available on the ultra low latency stream target details page in Wowza Streaming Cloud. If your connection code has been used or is expired, click Regenerate Connection Code to get a new one. If you're using the current version of the GoCoder app for iOS, enter the target's connection code in the app to use the app as the source for your live stream. Tap the Connect icon (the Wowza gear). In the Connect To menu, tap Wowza Streaming Cloud. For Connection Code, enter the Wowza Streaming Cloud ultra low latency stream target's connection code, for example, 24cedc. If you're using an older version of the GoCoder app for iOS or the Android version of the app, parse the connection details from the ultra low latency stream target's primary URL into the host domain, port, application name, and stream name. This connection method is also useful for troubleshooting a connection with a connection code that isn't working as expected. For Server, enter the target's host domain, which is origin.cdn.wowza.com. Tap Back and then tap Application. For Stream Name enter the alphanumeric stream name from the ultra low latency target, for example, 0I1q1UHJEN1q84NA2gvuuywllGwn5f4e. Tap Back and then tap Source Authentication. Make sure Source Username and Source Password are empty. To quickly test playback functionality, use Wowza Player Builder for Ultra Low Latency to preview the stream. Wowza Player for Ultra Low Latency works with the latest version of most modern web browsers such as Google Chrome, Firefox, Safari, and Microsoft Edge. Note: Wowza Player for Ultra Low Latency currently supports HLS streams only for browser-based playback on iOS devices. HLS streams have higher latency than ultra low latency streams. For ultra low latency stream playback on iOS devices, see Play an ultra low latency stream with Wowza GoCoder SDK for iOS. Navigate to the Wowza Player Builder for Ultra Low Latency from within the Wowza Streaming Cloud web manager. In Wowza Streaming Cloud, click Advanced on the menu bar, and then click Stream Targets. Select your ultra low latency target on the Stream Targets page. Click Test player for Wowza ultra low latency targets to launch Wowza Player for Ultra Low Latency with prepopulated fields for License Key, Stream Source, and (if you enabled HLS) Backup Stream Source. Optionally enter a Title and Description that will appear on the player, and adjust the player Size options if desired. Click Player Options, and then select or edit any of the Playback Options and add a video poster image if desired. For more configuration options and instructions on how to embed Wowza Player for Ultra Low Latency into a webpage, see Configure Wowza Player for Wowza Streaming Cloud ultra low latency streams. In the Wowza GoCoder mobile app, start sending video. In Wowza Player Builder, click the Play button in the player preview to see your test stream. If you have trouble sending a stream through the GoCoder app, check the settings in the Connect the GoCoder app manually section. You also may need to regenerate a connection code. You can do this in the stream target details page in Wowza Streaming Cloud web manager.